There’s this strange stereotype in many cultures about the language learner. When you mention that you’re learning Chinese, the image that pops into people’s heads is most likely one of you hunched over textbooks and complicated-looking dictionaries, all by yourself. This is odd, because language is all about sounds, not books. It’s about communication, not sitting alone with a dictionary in the library. If you want to learn Chinese and actually use it in a meaningful way, you’ll have to get used to how it sounds coming out of the mouth of a native speaker. If you want to do that, you’ll need to use audio to learn Chinese. This is especially true because Chinese uses a character-based writing system. Learning how to read and write in Chinese won’t help you pronounce the third tone correctly. This differs from languages that are written nearly phonetically, such as Spanish. Both reading and listening are important if you want to become fluent in Chinese, but you can’t focus exclusively on the written language and expect to be able to understand what the announcement at the Beijing train station just said. I have good news. There are many, many ways to use audio resources to learn Chinese, and there are tons of resources available. We can narrow them down into two huge categories: Some Chinese audio resources are made by and for native speakers, while others are created specifically for language learners. Both types of resources are essential for mastering Chinese. Why Learn Chinese with Audio? The more audio resources you use, the more natural the rhythm and cadence of Chinese will feel to you. You’ll be able to mimic the sounds and the speed of native Chinese. Listening to a lot of Chinese audio makes this feel more natural to you, so you’ll be better able to mimic this while speaking. One of the best ways to learn how to pronounce words correctly is through listening. You’ll get exposure to thousands of examples of Chinese tones and Chinese sounds. You’ll also be able, again, to mimic. When you’re learning pronunciation, speaking along with audio that you’re familiar with is one of the best ways to improve. Note that I say audio you’re familiar with. One of the keys to improving your pronunciation with audio is to listen to the same audio recording repeatedly. Learning through audio will ease your transition into the real world. In the real world, people talk to each other. While many language learners find themselves terrified of speaking, in reality it’s often harder to understand what native speakers are saying than it is to speak. Using a lot of audio when you study Chinese will make understanding native Chinese speakers that much easier. Learning with audio allows you to learn both actively and passively. Active learning means you’re focused 100% on your studying, whereas passive learning refers to study methods that can help your Chinese but that don’t require all of your attention. Listening to a few Chinese songs on the bus, for example, is passive learning. You’re just casually listening to them play in the background as you look out the window, and you’re not as focused on mastering every word, phrase and tone. Audio resources are ideally suited to passive learning. Using a lot of passive learning allows you to dramatically increase the amount of time you’re exposed to Chinese without giving up any other activities. The best part? You can work on your active listening practice with the exact same audio resources, so you’ll get plenty of repetition between all of your various listening activities. Most audio resources are really fun. Certainly much more fun than dictionaries or textbooks. If you have fun studying, you’ll study more. If you study more… well, you’ll learn Chinese faster! Examples of audio for language learners include recordings that accompany textbooks, podcasts for language learners, audio-based language learning programs like Pimsleur and graded readers with an audio component. These are all created with the needs of foreign language learners in mind. Sure, at times you’ll find yourself listening to something which sounds slower, clearer and more formal or polished than native Chinese, but using this type of audio is a good way to get your ears tuned into the language without feeling overwhelmed. Many textbooks come with an audio recording. If you’re looking for a textbook (and it wasn’t assigned by a class), select a textbook that has an audio component. This is probably the most boring of all of the types of audio, but it can be useful. Having the audio available to supplement your textbook will give you all of the benefits listed above. Podcasts for Chinese learners are abundant on the iTunes store. They’re made by teachers, fellow learners and enthusiastic native speakers who want to share their love of the language with others. These podcasts feature approachable language, clear language lessons and scripted conversations for listening practice. One example of a podcast for Chinese learners is Slow Chinese, but it’s far from the only podcast for Chinese learners. 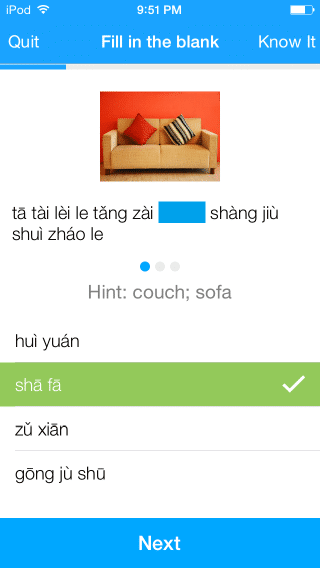 Yet another is ChineseClass101 by Innovative Language. This podcast learning program has over 1,200 audio and video lessons which cover skill levels from beginner to advanced, and all the lessons are produced by teachers and native speakers. Plus, they come with interactive learning tools! Graded readers take a piece of Chinese text, native or written for learners, and break it down so anyone can try to read it. They explain grammar, define vocabulary and make notes about culture. Often, they come accompanied with audio read by a native speaker. 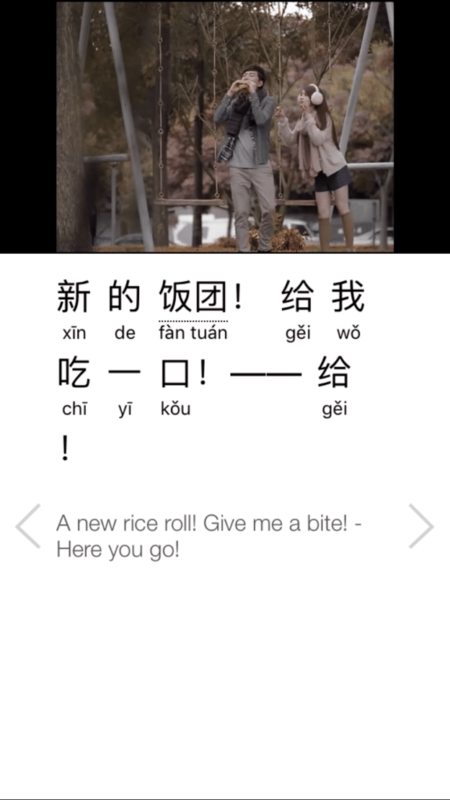 CCTV’s Easy Chinese program is a great resource for a graded reader that has an audio component, as is iMandarinPod. Audio-based learning programs are easy to find. If you’re on a budget, many public libraries stock CDs with language learning material. Pimsleur is perhaps the biggest name in audio-based language learning, so it’s a natural place to start. It’s also well worth any time and money you invest, since it’s designed to get you speaking Chinese right from the get-go. You’ll be prompted to listen, repeat and respond while each audio lesson (lasting about 30 minutes each) plays. While there’s a very strong auditory focus, there’s also secondary reading component that you can work with as well. At this level, you’ll want to use active listening techniques for all of these resources. That means listening once, reviewing to make sure you’ve understood everything by looking at a transcript of the material and then listening to the audio at least one more time, preferably several more times. Once you’ve listened to the recording at least once, talk along with the speaker at their pace, trying to emulate his or her pronunciation and intonation. Beginners should stick to beginner-level material, and they should focus on audio clips that are relatively short. Think of 5 minutes as the absolute max length. Start using some of these resources, especially podcasts for Chinese learners, for passive listening. Listen to a podcast while you do other activities. Don’t neglect more active audio learning, but try to fit more exposure to Chinese into your day by listening to podcasts while you do other things. Once you’re more comfortable with the basics, really hone in on mimicking the pronunciation in the audio resources you listen to. It’s helpful to find a podcast or resource that’s always produced by the same person, so you can become familiar with his or her voice. You’ll likely be starting to rely more on native-level audio at this stage, but that doesn’t mean that you should ignore audio resources made for advanced learners. Podcasts for Chinese learners that are all in Chinese, like Slow Chinese, are a good bridge to getting to native-level podcasts. They tend to focus more on cultural issues and other topics of interest, but podcasts for advanced learners that focus on grammar and vocabulary-building are fabulous for advanced learners who want to fit more learning into their day. Native-level audio includes music, TV, movies, podcasts, radio and audiobooks. A wide variety of Chinese music is available on Spotify, YouTube, Youku, CCTV and FluentU. The best online places to find TV and movies are all of the above, with the exception of Spotify. You can also see if your local library has any Chinese movies. Many do. Podcasts are best found by changing your country to China (or Taiwan) in the iTunes store and browsing the podcast selection. Lastly, you can find a huge bounty of Chinese audiobooks at 凤凰FM. 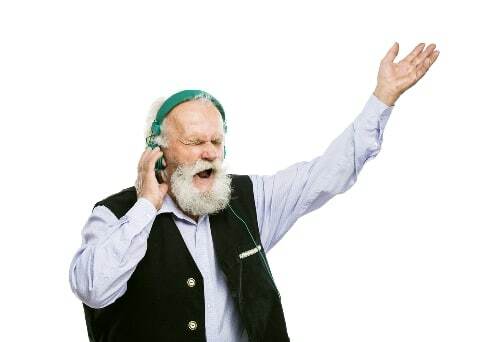 The best native audio for beginners is music—any Chinese tune can get stuck in your head and teach you language through catchy lyrics. A Chinese movie or podcast could be overwhelming, but a 3-minute song is both fun and educational. Get the song lyrics as well as a translation of the song lyrics. Try to sing along after you’ve listened a couple of times. 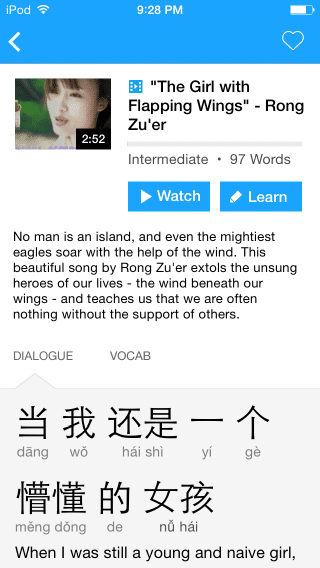 If you’re too lazy to look up the lyrics yourself, you could always opt to listen to music on FluentU, where you’ll have interactive subtitles (in Mandarin Chinese, either traditional or simple characters, pinyin and English) to help you out along the way. Another good activity for beginners is to watch Chinese TV and movies, but with English subtitles. This will increase your exposure to Chinese but won’t be nearly as overwhelming because the English subtitles will allow you to understand everything with ease. Start watching Chinese movies and TV with the subtitles in Chinese once you’ve reached the intermediate level. You may have to stop to look up words, but you’ll be forced to actually listen to the Chinese instead of paying attention to English subtitles. Also try to dip your toes into native podcasts. Ideally, you’ll find a podcast that’s about a subject that interests you and is short (5-10 minutes). You won’t likely be able to focus for longer than that, and at this level you’ll still need to listen repeatedly to even a short podcast before you’re entirely sure you know what’s going on. Keep it short, and podcasts are a winner. You’re ready to tackle all of the native-level audio at this point! In addition to listening to longer Chinese podcasts and watching full TV shows and movies in Chinese, you should also consider listening to audiobooks in Chinese. The first couple of audiobooks you listen to should be books that you’re already familiar with, either because it’s a book you’ve read in Chinese or because you’ve read it in your native language. Learning with audio is possible at every level and is a lot more fun than spending all day looking at books. Most audio resources give you a window into Chinese culture, too. You’ve got more than enough reasons to get started with audio learning now, even if you’re still a Chinese newbie. So, listen up!